2018 was a rough year for most people. Personally, though, I was pretty satisfied with how my life went, despite the world descending into chaos around us all. Due to starting graduate school and the ever mounting amount of work I found myself required to do, I was unable to see nearly as much as I wanted. With that said, I feel satisfied with my list here, as the only major film that piqued my interest that I missed was Suspiria. Everything else I feel comfortable circling back to later in 2019, and this list, I feel, accurately represents my tastes and what this year had to offer. Alfonso Cuarón’s latest is mostly on my list as an honorific, as I cannot possibly ignore the technical brilliance on display here. Roma is a film so gorgeously and confidently assembled that my eyes were affixed to the screen for the film’s entire run time, despite some of the narrative elements frequently forcing my interest elsewhere. Comparisons can easily be drawn between Roma and Fellini’s Amarcord, as each look back at a year in the lives of people in the respective director’s hometown. Both of these filmmakers excel in terms of their understanding of the craft, and their ability to create excellent tapestries of a time and place that clearly matter to them, and Cuarón’s affection for Mexico and the 1970s are on display in every frame of Roma. Every single technical element and performance carries this film to such heights, it’s a shame the narrative kept losing me. Otherwise I could easily see this being higher on my list. Brad Bird is honestly never as great as when he’s in charge of an animated project. While I adore Mission: Impossible — Ghost Protocol, it does not hold a candle to the action sequences in this, which is some of the best superhero action ever put on screen (and if not for two other films on this list, the best superhero film of the year). I get giddy just thinking about the cage fight/strobe light sequence. It is impressive that Bird returned to the Incredibles after over a decade and made a good movie, but the fact that Bird found a way to justify making the sequel a DIRECT sequel, essentially making The Incredibles: Chapter 2, and that I walked away enjoying this one more than the original, is a damn incredible feat. A bargain bin fantasy novel, complete with all the problematic tropes, set in the late ‘70s or early ‘80s, filtered through a drug-fueled psychedelic haze. I adore everything about this movie’s aesthetics, and Nic Cage is the perfect as the lead. He carries rage and grief in a wholly believable way, and his freak out in the bathroom is something that has to be seen to be believed, and not just because it’s clear the camera operator seems to fear for their life at some points. It may be extremely straightforward in terms of character motivation, but as an aesthetic tone piece, Mandy might be one of my favorite pieces of visual filmmaking ever. As a fairly sheltered and ignorant white male in his mid-20s, there’s a lot more to this film than I am possibly equipped to talk about. However, the fact I am able to say that while talking about an MCU film is something that I was never expecting to say, and I am thrilled to death that I can. Black Panther is a tour de force of genre filmmaking from the incredible Ryan Coogler, a layered and dynamic masterpiece that directly confronts what the existence of a nation like Wakanda would mean in the shadow of colonialism, and how much culpability they would have in such systems through their inaction and secrecy. Complete with staggeringly good performances from Chadwick Boseman and Michael B. Jordan, it’s heartening to see the MCU willing to let this sort of movie exist within their framework. Also, bless Coogler for just…going for it, ya know? I find talking about this movie in a cohesive manner very difficult because I see a lot of my own struggles with anxiety reflected in pretty much every frame of this film. So, I am going to just list some of my thoughts here: Elsie Fisher is a revelation, give her all the awards. The pool party sequence hit me right in the soul, I had a similar experience at the end of my eighth grade year. The sequence in the back of the car almost made me throw up. I love how social media just…exists in this film, not demonized nor glorified. And finally, BO BURNHAM WHY ARE YOU SO TALENTED, IT IS NOT FAIR. I don’t know if you knew this, but Spike Lee isn’t too terribly happy with the way politics-at-large are going right now. BlacKkKlansman manages to balance telling one of the most absurd true stories I have ever heard with directly criticizing the modern political landscape, drawing some not-too-shocking comparisons between the KKK and the current Alt-Right. The first 99% of this film is incredible, and would be enough to earn a low Top 10 spot, but the final few minutes instilled me with an anger so visceral that I felt like I was going to throw my phone through my TV. This is a display of truly great film making, and should absolutely go down as a classic. In this nightmare of year (feels more like decade at this point), we have been waiting for deliverance from misery by an avatar of pure joy, politeness, and sincerity. That savior has come, and he has a taste for marmalade. Paddington 2 is a shot of pure happiness and joy, wrapped up in a warm blanket of prison reform advocacy. In addition, Paddington 2 features career best work from Hugh Grant, and a delightful cameos from pretty much every contemporary British actor of any importance. If you haven’t let this delightfully lovable bear into your life, fix that ASAP. SUPERMAN AND TOM CRUISE HAVE A DOG FIGHT IN HELICOPTERS WHILE TRYING TO DEFUSE TWO NUCLEAR BOMBS AND THEY ALSO DID A HALO JUMP AND THEN AND THEN AND THEN……. Oh my God this movie just owns so hard. Easily the best action movie since Mad Max: Fury Road. It’s the best Mission: Impossible movie, featuring not only some of the best stunt work of any blockbuster I have ever seen, but also some of the most gorgeous cinematography this side of Roger Deakins. If I thought it had a chance, I would be screaming for this to get as many Oscar nominations as Fury Road did. I am forever going to be upset that I missed this in theaters. The “A24 Indie Horror” is quickly becoming my favorite genre. Hereditary is a masterclass in tone management, escalating a sense of dread and terror without over-reliance on overtly horrific imagery. Not to say Hereditary is lacking in that department, because it CERTAINLY is not, but most of the horror comes down to the way things are framed and the production design. A lot of the framing creates the sense that events unfolding are taking place within a diorama, which creates a feeling of predestination and inevitability that permeates everything. But then the second act kicks off and this movie becomes one of the most intense things I have ever seen. My girlfriend had to tap out halfway through because she was on the verge of an anxiety attack. Every single frame of the last 45 minutes of this movie seems mathematically calculated to deliver the most scares scientifically possible, and boy does it show. This will permanently find a place in my Halloween rotation, and only lost the #1 spot on my list supremely late into the year. Spider-Man means the world to me. As someone who was essentially the only non-athletic guy in my middle school, I found solace in the fact that Spider-Man was also a nerd and a dork like me. I felt inspired that I could do something good in the world without being popular or widely loved by my classmates. As I watched Into the Spider-Verse, I realized this was going to do the same for an entire generation of children, who can look at Miles and Gwen and Peter and realize the same thing. Everyone can find their place and live up to the great expectations their family may have for them. But most importantly, as Stan Lee was fond of saying, anyone can wear the mask. Anyone, absolutely anyone, can be Spider-Man. And this message is perfectly conveyed and encapsulated in every moment of Into the Spider-Verse, building to an emotional climax in the Leap of Faith/”What’s Up, Danger” sequence. Near perfect films do not come around very often. 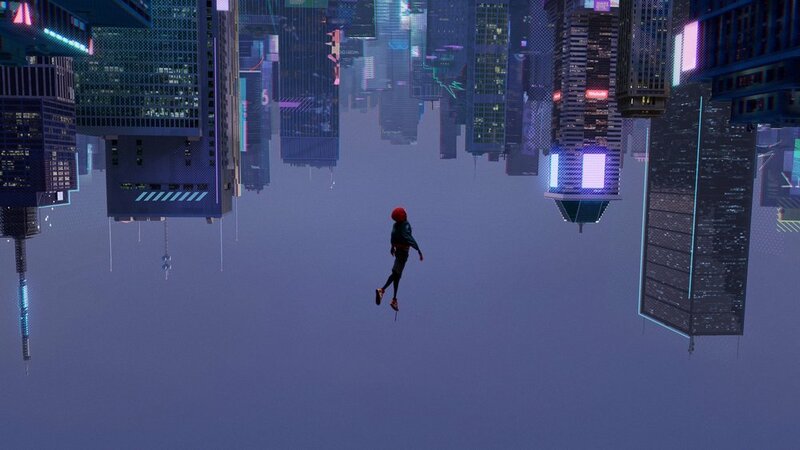 But I’m confident that Spider-Man: Into the Spider-Verse is one of those movies that will go down as a classic, a miracle of animation, and the best Spider-Man movie ever made.